You are currently browsing the tag archive for the ‘Bigfoot’ tag. Entrance into the underground lava tube. Highway 503 is a secondary approach to Mt. 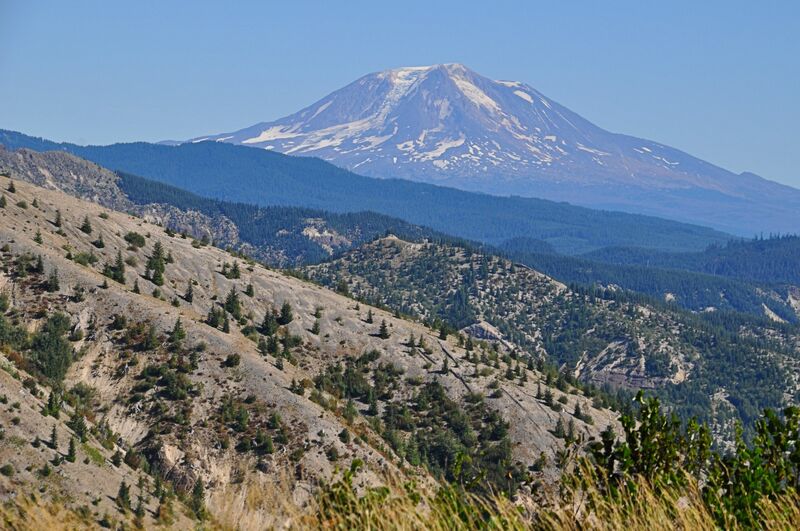 St. Helens, leaving the Interstate and heading south of the mountain and around the other side, so that one can view it from the East, rather than the north, as shown in my earlier posts. The stops along the way reveal some fascinating aspects of the volcano one can’t learn from the other, more popular highway. 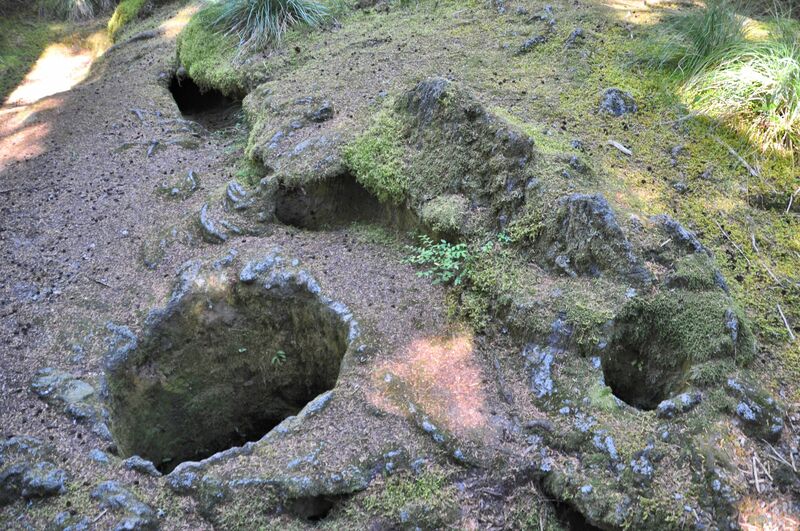 I first explored Ape Cave, an apt name in this pocket of Bigfoot country. 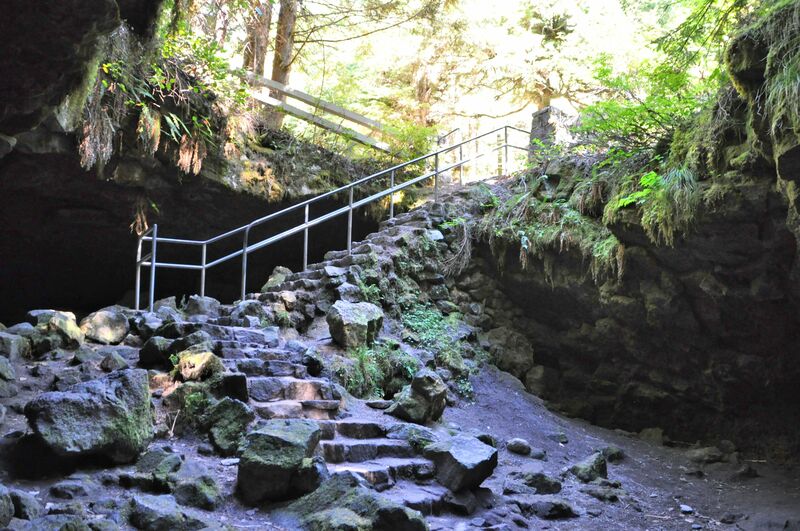 The name of the cave is related to the Sasquatch legend in a surprising way. There are multiple stories, so forgive me that I only include one version: In 1924 some Boy Scouts were goofing around in the area, screeching and acting like primates, picking up lightweight pumice rocks and hurling them into a canyon. They did not know that there was a cabin below. From out of that cabin burst astonished miners, squinting up at the ridge and believing they were under attack by apes, which is the story they reported when they got to town. This led people to speculate that the tall tales of ape men had finally been proven legitimate. Years later, a local youth group named themselves the St. Helens Apes after that legend. In 1951, when the youth group were among the first humans to explore a newly discovered cave, they dubbed it the Ape Cape, and the name stuck. 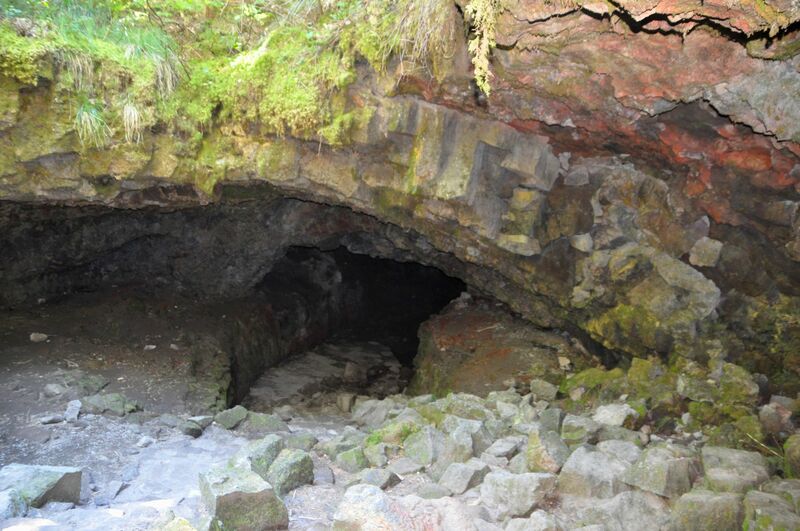 At the entrance to the Ape Cave, you can see the arched roof formed 2000 years ago. The rubble piled up when parts of the roof caved in. 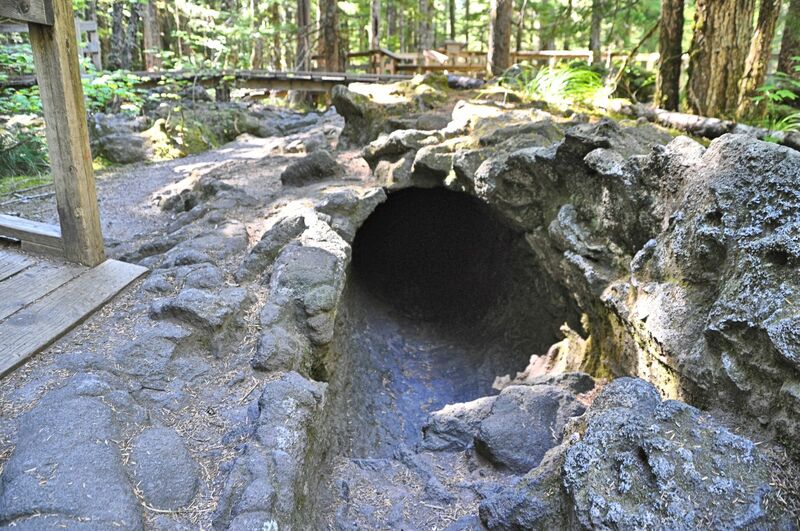 Lava tubes are a special kind of cave, formed in a volcanic eruption. 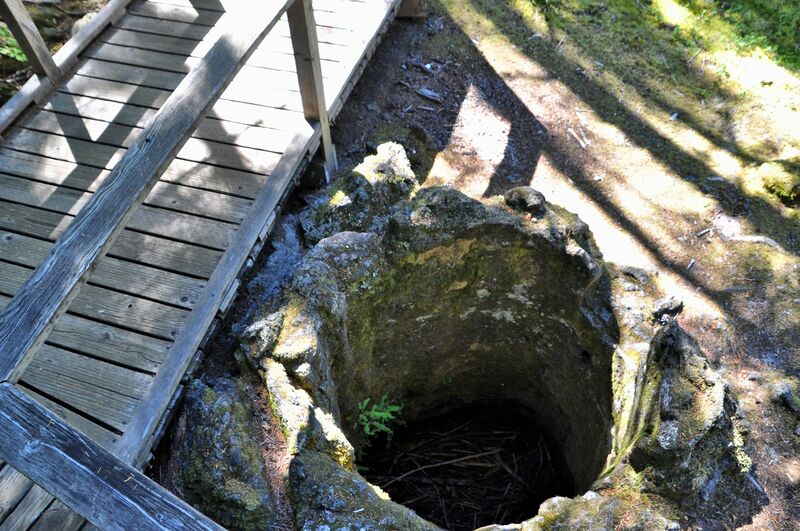 I explored one in Bend, Oregon in 2011. Only once in Mt. St. Helens’ history did she erupt with molten lava. 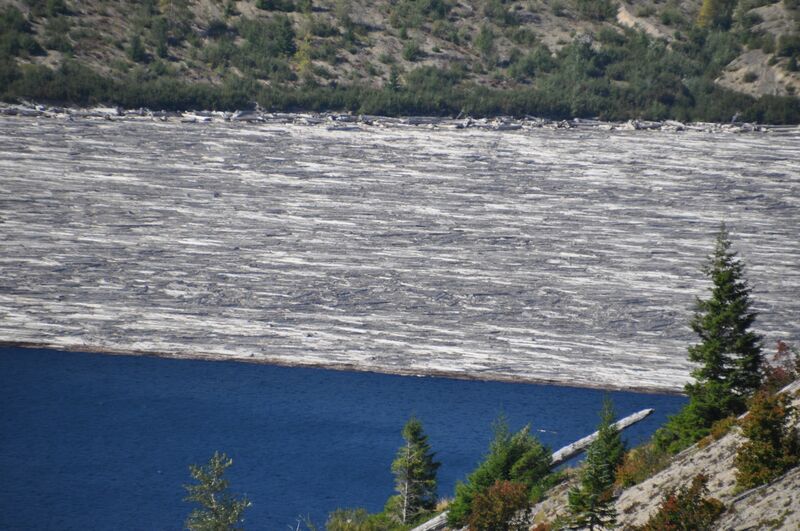 This kind of eruption is rare in the Cascade Range because of our geology. Magma rising to the surface here has a high silica content, which results in the magma taking on a more solid form, trapping gases and resulting in an explosive eruption. Less silica allows a fluid eruption of molten lava, called basalt. 2000 years ago, Mt. 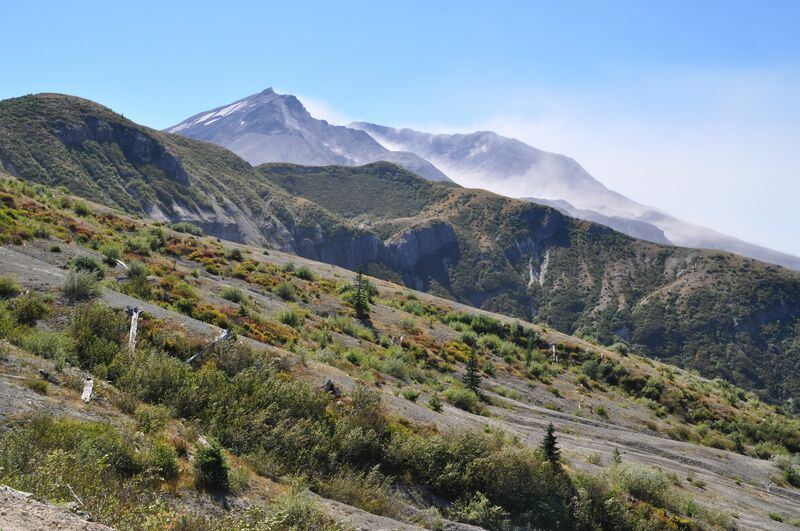 St. Helens erupted with fluid lava. As it flowed in enormous, thick rivers, the outside of the river cooled and hardened while the inside remained hot and continued to flow. The lava melted the rock it was flowing across, carrying it away and deepening the channel. 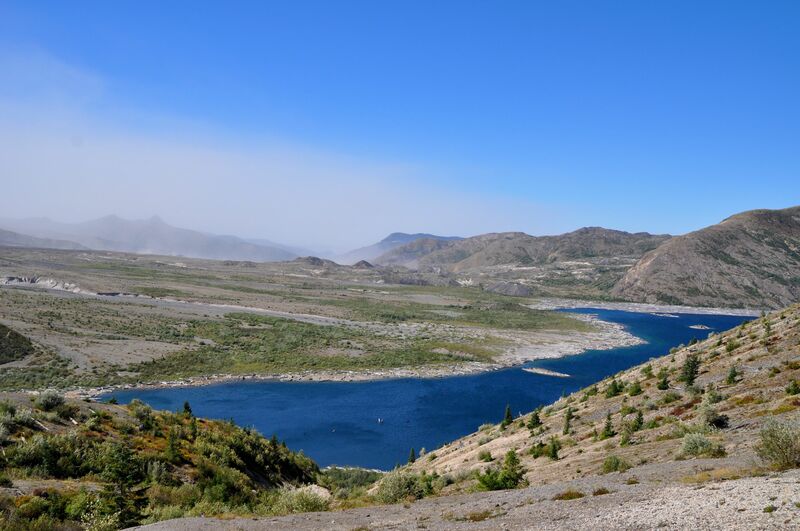 When the eruption finally stopped, the remaining liquid river flowed out the end of the tube, emptying it, and leaving a lava shell that eventually was covered by dirt and forest. 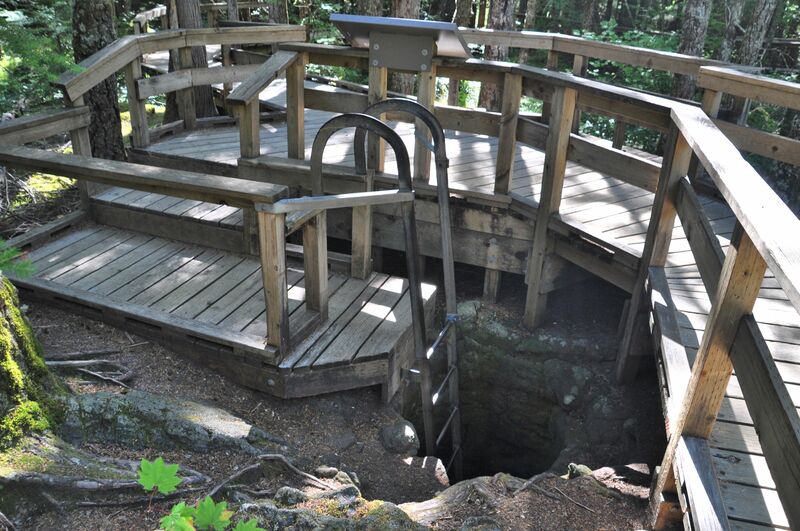 Ape Cave is 13,042 feet (2 1/2 miles) long, and I did not have time to explore much of it. I’ll come back another day. Evidence of the changing season. Next I visited A Trail of Two Forests. On a Thursday morning in gorgeous weather there was not another soul and I had the trail entirely to myself. Sometimes that’s one of the best things about living in the West: hardly any people. 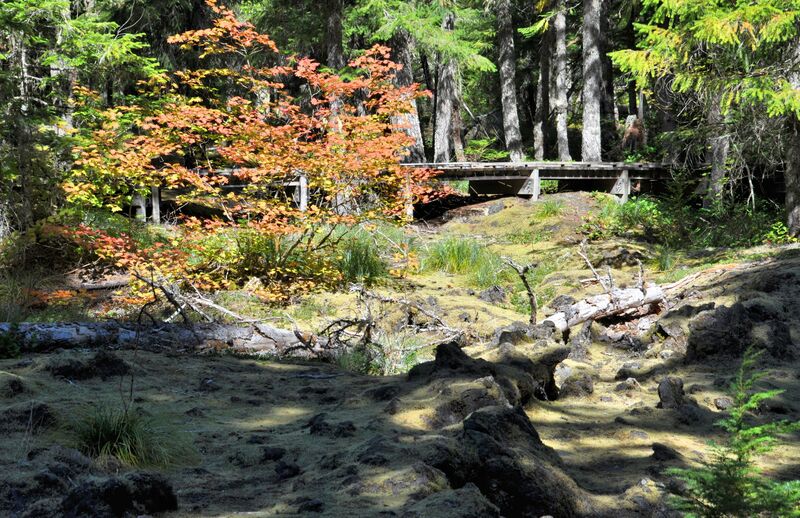 The trail is entirely on boardwalk, and makes a short loop through the forests. The two forests mentioned here are the one that exists today, and the one that disappeared in the lava flow that created Ape Cave. Hollow shells where trees used to be are well-preserved here. It takes hardly any imagination to visualize what was there when the lava struck, since the lava shells tell the story. One large hole from a tree that had been standing, a small standing tree on the right, and stretched from the top left toward the bottom center is the partial shell left from a tree that had been lying down when the lava hit. What’s left when lava hits a forest. Looking into a shell created when lava cooled around a tree, and then the tree burned away. Large tree hole beside the trail. It’s more impressive in real life. 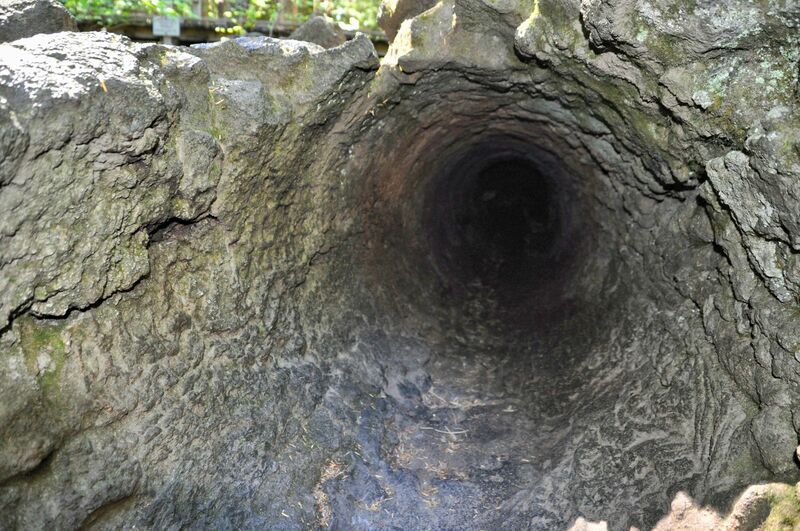 This is where one can climb down into the tunnels left by trees. I found this video that has some great shots of the places I saw. I continued on to St. Helens herself. As the Jeep climbed out of the river valleys and up into the ridgelines, the wind rose around me. My destination was Windy Ridge, but I had assumed the name referenced the natural buffeting one gets in exposed places. The wind during my drive seemed unusually high, particularly since I was still far from Windy Ridge. 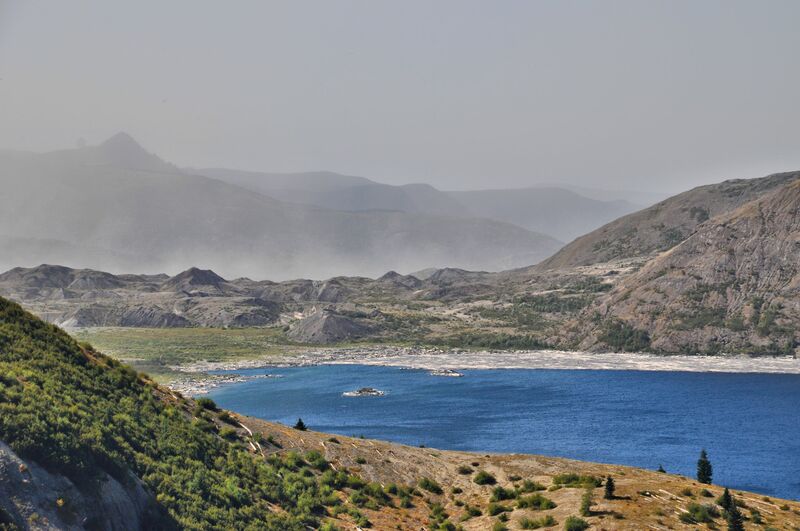 Wind lifts volcanic ash from the crater. It’s a beautiful drive and not as geared for tourists as Highway 504. 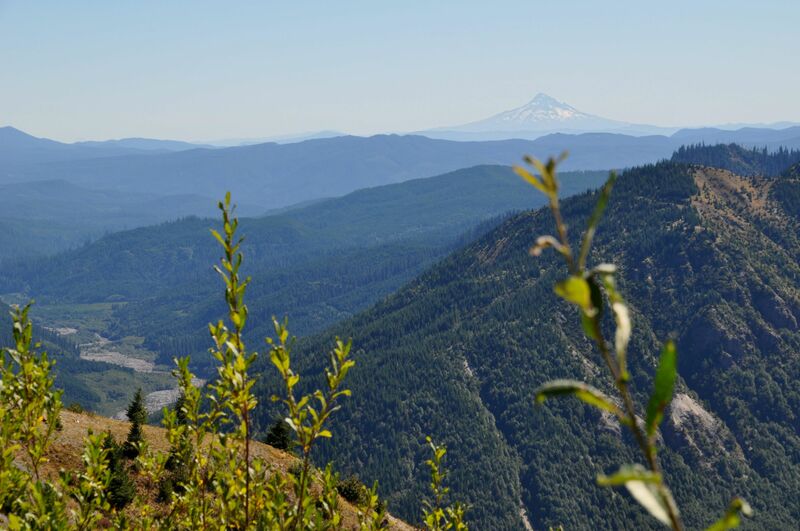 No visitor centers and fewer informational signs at viewpoints. In fact, when I arrived at Windy Ridge, there was not even a visitor center there, though there was a park Ranger giving talks. He stood in a small outdoor amphitheater with a plexiglass wall that provided some protection from the wind while allowing us to see the crater of Mt. St. Helens while he talked. He confirmed that it was an unusually windy day. We could see clouds of ash lifting from the crater and drifting off to the West. 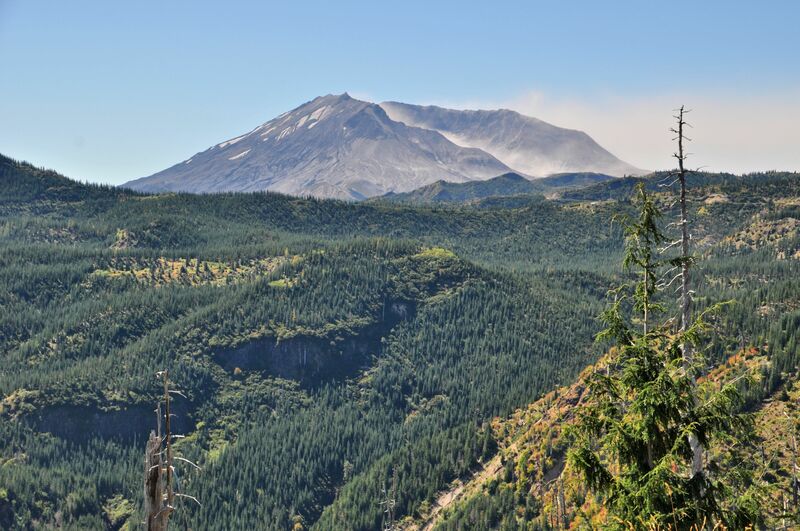 One woman asked the Ranger if it was steam, fearing the volcano was active on that very day. We were in no danger, but it was a fascinating sight to see. The valley I had photographed the day before was murky with airborne particles and I was grateful to be on the East side in all that wind. The wind! It was tremendous! I didn’t feel safe near the edge of the bluff, and could hardly remain upright as I walked across the parking lot. I decided not to climb Windy Ridge for a better view of the mountain, and risk getting blown into the next county. Our view behind the Ranger as he talked. Spirit Lake in the foreground, and the ashy skies behind it. The Ranger’s talk that day was about the wildlife making a foothold in the valley before us. He didn’t bother using his posterboard media and rather we in the audience took turns chasing them down when the wind carried them away. In 34 years, much of the area’s natural wildlife has returned to the land and also to the lakes. He talked about how it began with small critters at first, who flourished and made an appealing smorgasbord for larger critters, who hunted them. Mice came, and other larger mammals, followed by coyotes. I had heard them the previous evening while I sat and waited for the clouds to clear from the mountain peak. Barks and cries of a dozen voices rose from the valley, their haunting songs thrilling me. 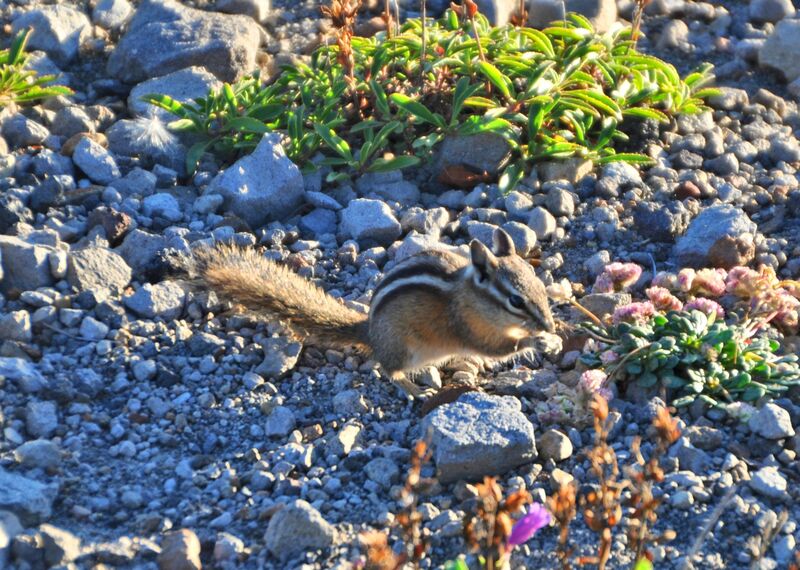 A chipmunk nibbles something tasty. He also talked about the fish in Spirit Lake, planted without permission by anonymous citizens. Somebody had hiked down the steep, ashy, gravelly slope carrying buckets of fish, one assumes. The lake was packed full of tasty things for fish to eat, so when the trout arrived they did what fish tend to do, and they ate to nearly bursting. The trout grew too much and were sickly, but gigantic. But the species survived. 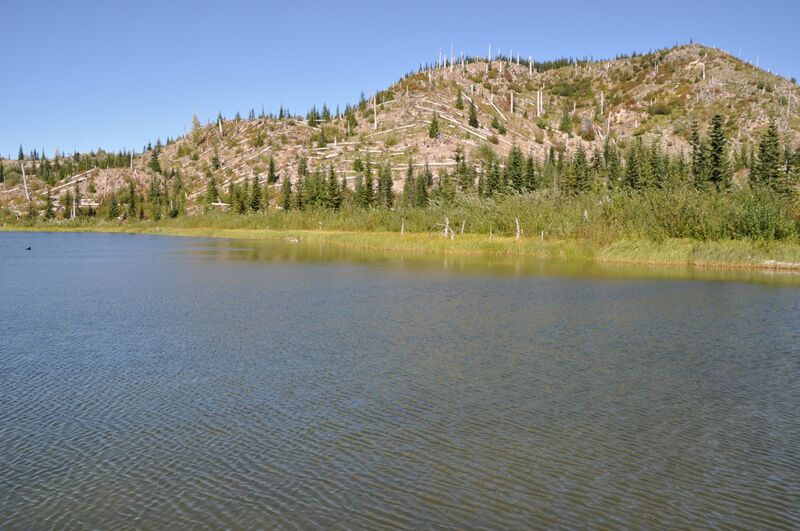 Today the ecosystem of Spirit Lake is balancing out, and the fish are healthier and smaller, but the Ranger says they are still much larger than typical trout ever get. 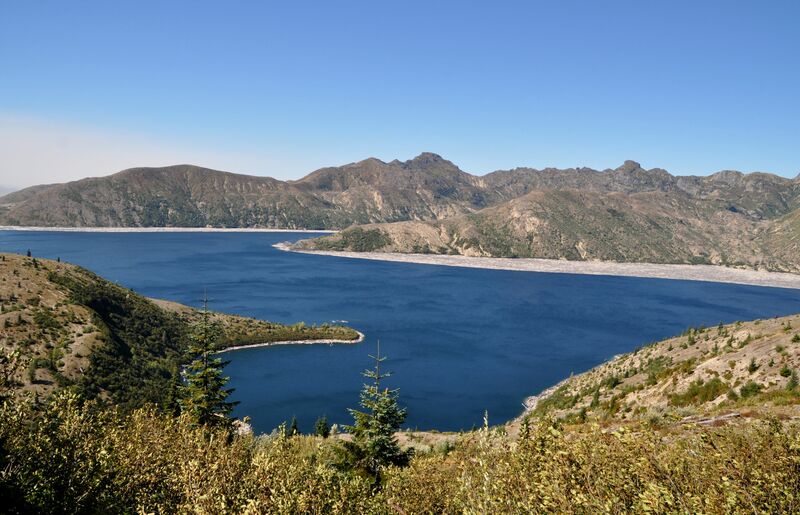 He said no one has ever been spotted trying to fish the lake inside the National Monument, so the purpose of going to so much trouble to stock it remains unknown. I was so interested in how the air was clear over me, but thick with dust over the ash-filled valley. You’ve been wondering, “What’s that silver stuff in the lake?” Here’s a good look. That is a mat of decomposing trees that were blown into the lake 34 years ago. I made the return journey slowly, taking time to gaze out at Mt. Adams (the closest volcano), Mt. Hood, and Mt. Rainier from different spots along the highway. I walked a trail to tiny Meta Lake, recovering from the eruption beautifully. Beside the trail were huckleberry bushes loaded with fat, ripe berries, and I ate a bunch of them. 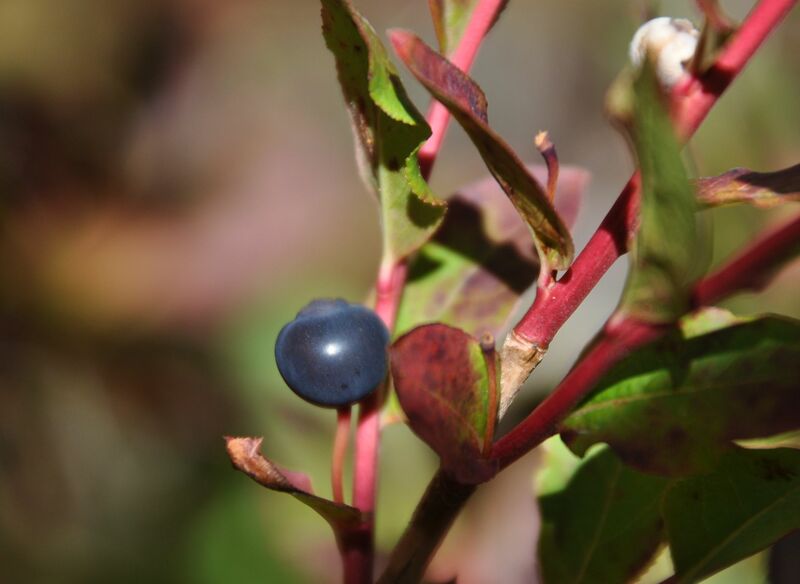 To someone who grew up eating huckleberries, nothing can compare. There must be no bears here, or perhaps the berry bushes are loaded everywhere and the bears don’t need to come too close to humans to get food. Another great thing about this trip was how close it is to home, and that’s where I headed next. I chose the trip for that reason, since my Great Aunt had passed away and I needed to be with family for the remainder of my vacation time. Nice to know that if I ever have a yearning to see some of America’s incredible sights, Mt. St. Helens is less than two hours away. Meta Lake. Remnants of the destroyed forest are still visible while the new one regenerates, purely on Mother Nature’s timeline.